Stop! Wait a minute … get your cup and put this liquor in it … take a sip … you will thank us later… Angus, get this Scotch! James Allardice was the second person to apply for a license to distill Whisky in Scotland, way back in 1826. Them’s some good times, my friend! Over the years, GlenDronach has been owned by a veritable Who’s-Who of the historic lineage of Whisky masters; from Walter Scott, to Captain Charles Grant, and William Teacher & Sons. The late 1990’s saw some troubled times for the proud distillery, and many thought that the spirit suffered. But the good times roll again! The BenRiach Distillery Company bought out the property and has restored this Highland single malt to its former glory, and then some. Their entire Whisky line is “sherried,” meaning matured only in Oloroso Sherry casks. Highland, single malt, sherry casks, proper aging … We're sold! If you want your Whisky to set off the smoke alarm as you pull bits of charred oak from your teeth, this is not your dram. If, on the other hand, you want to taste the revival of a historic, Highland single malt brought back to its heritage of excellent distillation, premium components, and proper maturation in Oloroso Sherry casks … you are going to LOVE this gorgeous Scotch. Some Whisky can be said to have “body.” If put into a beauty competition context, GlenDronach 18 will make all its competition bite their lips with envy. It really is a beauty. This Whisky pours like amber-gold watercolor in the rain. Richness? When Warren Buffet needs advice he calls Billy Walker—Whisky legend and master blender at GlenDronach. The color is right, the aroma is right, the palate is right, the finish is right … smooth and pleasantly sweet with cherried-walnuts and a long, lingering caress at the finish. 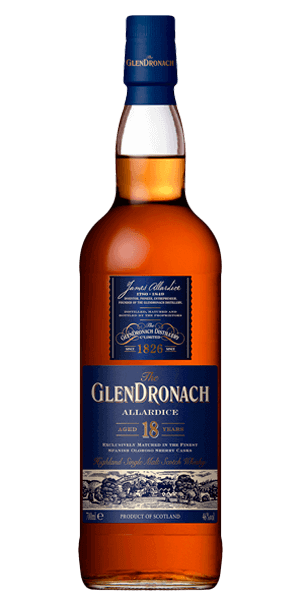 What does GlenDronach 18 Year Old Allardice taste like? The Flavor Spiral™ shows the most common flavors that you'll taste in GlenDronach 18 Year Old Allardice and gives you a chance to have a taste of it before actually tasting it. Dark Amber-gold, like wild orange honey. Dried cherries and hints of vanilla and dark chocolate. Smooth … dark cherries and walnuts with a hit of orange zest … like a Christmas cake. Pralines… like the kind you get in New Orleans. A very good dram. Love the richness. Definitely one of my all-time favorite! Very smooth and cherry. Delicious dark fruits, hint of dark chocolate. Tremendous dram. Mind blowing. Best scotch I've ever had and I've BEEN to Scotland. This is one of my favorite highlands ever!! A heavily sherried 18, and a good buy if you're looking for that age, but Glendronach hit the Goldilocks zone with their 15...which might have ruined my taste for this one. Smooth...the cherries leave a nice taste on your palett without being too over powering...definitely a great buy for any scotch lover.